After capturing the American League pennant in 1954, the Cleveland Indians finished in second place to the New York Yankees the next two seasons. They sank to the middle of the pack in 1957 and 1958 but, led by a newcomer from Detroit, were back in the pennant chase in 1959. John Patsy Francona was born on November 4, 1933, in Aliquippa, Pennsylvania, on the Ohio border. He was the second son (older brother David) born to Mr. and Mrs. Carmen Francona. He was given the nickname Tito (“little one” in Italian) by his father. Carmen Francona worked most of his life as a tool grinder in the steel mills. He supplemented his income by tuning pianos on the side. When Tito was 10, the Francona clan relocated to nearby New Brighton. “My mom wanted to get away from all that smoke,”4 recalled Francona. But Francona found that athletic choices were not plentiful in his new surroundings; New Brighton did not even have a little league. But Tito was not deterred. During summer vacation he would wake up every morning at 5:30 to catch a ride with his father to Aliquippa. Carmen would drop his youngest son off at a relative’s house, and Tito would wait around until it was game time. His father would then pick him up in the afternoon for the journey home. Francona was a football star at New Brighton High School. He played quarterback, and was considered a triple-threat player. He scored over 100 points his senior year and led his team to the West Pennsylvania Class A Championship. He was selected All State in 1951. But in spite of the college scholarship offers that came his way, Francona knew that playing big-league baseball was his sole goal. “The school team only played a nine-game schedule and to me that wasn’t much of a season,” said Francona, who passed up playing high-school baseball in his junior year. “I had a chance to play American Legion ball and with a team in the County League. Between the two, I got to play every day.”5 The exposure playing on these teams earned Francona an invitation to play in the prestigious Hearst All-Star Game at the Polo Grounds in New York. Tito’s uncle, John Francona who resided in nearby Beaver Valley, reached out to the St. Louis Browns about his nephew. The Browns took a long look at the youngster before offering him a $5,000 bonus and a $250-a-month salary. The day after he graduated from high school in 1952, Tito reported to York, Pennsylvania, the Browns club in the Class B Interstate League. The York lineup had seven left-handed batters, including Francona. He faced a steady diet of left-handed pitching from the opposition. He didn’t fare well, batting .227. Although he hit well during spring training in 1953, Francona was demoted to Aberdeen (South Dakota) of the Class C Northern League. Initially disappointed about his assignment, Francona felt fortunate to play under manager Barney Lutz. “I was lucky to have a fine understanding manager in Barney,” said Francona. “He was great at handling young players.”6 Lutz emphasized to Francona that it did not matter much which league he played in as long as he had a good measure of success. Francona played first base and batted .325 for Aberdeen. Francona’s stop in Aberdeen had an unexpected benefit when teammate Bill Strange introduced him to Roberta Jackson. They started a courtship, which was interrupted when Francona was drafted into the US Army for a two-year stretch. While he was away, the Browns were sold and moved to Baltimore. Paul Richards was the new skipper and organized a rookie school in the spring of 1956, when Francona was out of the Army. Francona performed very well, and Richards rewarded him with a $6,000 contract and a starting job as the Orioles’ center fielder. After a slow start, he hit .341 in July with 5 home runs and 21 RBIs. He finished the year with 445 at-bats, and a.258 batting average. On October 2, 1956, Tito and Roberta tied the knot. They were married for 35 years and had two children, Terry and Amy. In June 1957, Orioles catcher Gus Triandos suffered a back injury. The Orioles had to call up a catcher and needed a roster spot. Francona was optioned to Vancouver of the Pacific Coast League. His stay at Vancouver was brief, but when he returned, Francona caught a bad break, literally. While trying to make a shoestring grab in a game against Chicago on June 9, Francona broke a bone in his left hand. He was sidelined for about a month. When he returned, he went back to the bench, starting a handful of games in the outfield. Baltimore felt that Francona was expendable, and dealt him to the White Sox as part of a seven-player deal on December 3, 1957. Again Francona suffered a setback. He was playing winter ball in Puerto Rico when he was diagnosed with hepatitis. He returned home and was placed on a strict diet. Eventually the situation cleared, but it was also discovered that Francona had an irregular heartbeat. When he reported to White Sox spring training, he was given a good report by a heart specialist who gave him the go-ahead to play ball. But Francona’s time in the Windy City was short. He did not fit into manager Al Lopez’ plans and he was on the move again. After just 41 games on the South Side, Francona was shipped to Detroit with pitcher Bill Fischer for infielder Ray Boone and pitcher Bob Shaw. 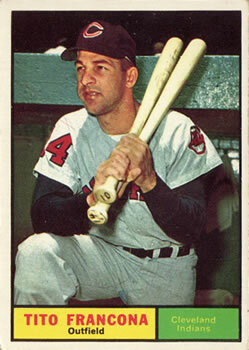 Francona finished the 1958 season playing in 86 games for the two teams and batting .254 with 1 homer and 20 RBIs. Francona did excel as a pinch-hitter,batting .379 (11-for-29) in that role. During spring training in 1959, Detroit general manager John McHale was thinking of sending Francona to the minors, but wound up including him in the trade with the Indians on March 21. Francona proceeded to have a breakout year, surprising everyone but himself. He never lost confidence in his ability. Gordon realized that he could not keep Francona on the bench. His bat was needed in the lineup. Francona started 35 games at first base to spell Vic Power, and 61 games in center field, splitting time with Jimmy Piersall. Both Power and Piersall were right-handed batters, which gave Gordon plenty of options to use the left-handed-hitting Francona. Tito proved that he was not just a one-year wonder, batting .292 in 1960 and leading the American League in doubles with 36. The next year he batted .301, and posted career highs in RBIs (85) and hits (178). Cleveland had a revolving door at manager, going from Gordon to Jimmie Dykes to Mel McGaha. In 1963 Birdie Tebbetts took the reins. Francona hit to the opposite field often, believing that it was best for him to hit the ball where it was pitched. But Tebbetts preferred pull hitters. In 1964 Francona was back to languishing on the pine. On August 22, 1969, the Braves sold Francona to the Oakland Athletics. Again he was thrust into the reserve role. Three weeks after joining the A’s, on September 12, Francona equaled his career-best mark of five hits in a game. He went 5-for-5 against Chicago, driving in two runs and scoring twice in a 12-5 Oakland win. Dealt to the Milwaukee Brewers on June 22, 1970, he ended his career at the end of the season. Francona retired with a batting average of .272 for his 15-year major-league career. He hit 125 home runs and had 656 RBIs. In retirement, Francona worked as the parks and recreation director in Beaver County, Pennsylvania. He was inducted into the Beaver County Sports Hall of Fame in 1978. The city of New Brighton renamed its Little League field Francona Field to honor Tito and his son Terry. Roberta Francona died in 1992 after a battle with breast cancer. He and his second wife, Jean, lived in the New Brighton area during the summer months. On October 6, 2012, Terry Francona was named the 42nd manager in Cleveland Indians history. Terry played 10 years in the major leagues (1981-1990). Like his father, he was an outfielder-first baseman. He managed in Philadelphia and Boston, leading the Red Sox to two world championships, in 2004 and 2007. John “Tito” Francona died at the age of 84 on February 13, 2018. 1 Chuck Heaton, Cleveland Plain Dealer, June 26, 1959: 33. 4 Hal Lebovitz, Sport, June 1960: 82. 7 Chuck Heaton, Cleveland Plain Dealer, May 2, 1959: 21. 11 Bob Broeg, St. Louis Post-Dispatch, March 22, 1965. 12 Wayne Minshew, The Sporting News, May 17, 1969: 21.